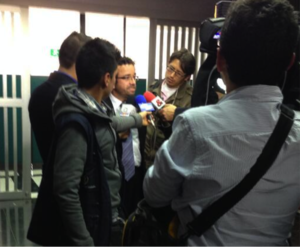 A judge rules seven years later on a case of the Colombian State against trade unionists. In the middle of an election race, President Santos will have to publicly apologize for crimes his main rival committed. On April 11, a judge in Colombia made a final ruling on a long-standing case of slander against prominent politicians. In July 2007, then-President Álvaro Uribe, his Vice President Francisco Santos, and his personal aide (and, incidentally, cousin of Pablo Escobar, a point I’ve made before) José Obdulio Gaviria all made public attacks on a number of trade-unions from Cali, namely Sintraemcali, Sintraunicol, and Sintrateléfonos. As a result, current President Juan Manuel Santos will issue a public apology on behalf of the Colombian government for the crimes against trade unions committed by his predecessor. The hearing room itself had the standard, slightly-disappointing vibe of every municipal chamber I’ve been to in Bogotá—low ceiling, echoing white walls, plastic chairs, strip lighting, “real-wood effect” desks and so on—but it was well attended, not least by television cameras, forcing the attendees to high-step over cables and duck the lenses. Earlier in the week, the aforementioned Obdulio Gaviria had made a court-ordered public apology for a slanderous opinion column he had written in 2007. Obdulio's column “All Sins Begin as Thoughts” claimed these trade unions were “enemies of our democracy,” and part of the “universal brotherhood of terrorism,” as some of their members had attended a conference of Latin American communist parties in Quito, Ecuador. Obdulio had publicly retracted his statements, but the judge ruled that as symbolic reparation (reflecting emerging international norms) the retractions and corrections must be printed in the papers that had originally printed the offending column, with the same size and prominence. In the same month in 2007, Francisco Santos had linked Sintraemcali, Sintraunicol, and Sintrateléfonos with “subversion and terrorism.” In the same vein, Uribe, at a celebration of Colombian Independence in New York, declared how “it hurt him” to think of the conference in Ecuador, and of the damage done to Colombia by the “mezcla maldita” of unionism and terrorism. In the aftermath of these proclamations, these unions received numerous threats from paramilitary groups, in particular the Águilas Negras. Union leaders were forced to flee the country for safety, and began proceedings for damage and slander, which came to an end this past week, seven years later. As part of the legal proceedings, the unions' lawyer Jorge Eliecer Molano, who FOR Peace Presence is proud to accompany, requested that Obdulio, Francisco Santos, and Uribe be seen to have represented at the time institutions of the Colombian state. The judge allowed this request, which means that those same institutions of the state today, namely the President's and Vice-President's offices, will have to publicly ask the unions for forgiveness for the crimes committed against them by the office of the President. The result of this week's ruling, is that President Santos will, on June 21st in Colombia and 22nd in New York, make a public apology asking forgiveness for the crimes of his predecessor, who is also his most ferocious political critic and rival, in the run-up to the Presidential elections. Amongst the gathered journalists (off-camera, naturally) this was the cause of much mirth and the doing of impressions (“My country, today I humbly beg forgiveness for the crimes of this [insert snide Colombian slang here]!”). Obdulio Gaviria and Francisco Santos are both high-profile members of the Centro Democrático, the movement founded and run by Uribe around a year ago and called “Colombia’s Tea Party” by the President. Their candidate for the Presidency, Óscar Iván Zuluaga, has been Juan Manuel Santos’ closest rival in the polls. Uribe, now a Senator-elect (along with Obdulio), has been caustic in his criticisms of President Santos, most particularly Santos’s commitment to peace talks with the FARC and mention of any deal on “transitional justice.” It is with no little irony then that President Santos will be apologizing for the state crimes committed by Uribe during his time as president. Indeed, this will be the second time in recent months Santos will be doing this—in December 2013, Santos apologized for Uribe’s comments accusing the Peace Community of San José de Apartadó of supporting the FARC (that time the apology was ordered by the Inter-American Court of Human Rights). It is a telling pattern, not just of the creeping official recognition of the abuses of power committed by Uribe’s regime, but also of Uribe’s modus operandi as president. In addition to his increasing militarization of Colombian society, Uribe repeatedly and publicly indicated who was undesirable in his vision of Colombia—namely social activists and trade unions. Without giving an actual order, these public pronouncements made his preferences clear, and it is no surprise that these pronouncements were followed by threats and atrocities committed by paramilitary groups. Between 2005-2009 (under Uribe) more trade unionists were murdered in Colombia than the rest of the world put together, concurrent with a huge expansion of paramilitary power on the ground and in national and regional politics. This court ruling highlights a growing official recognition of state-crimes committed under Uribe, not to mention the impunity and danger his presidency represented. It also sets up the farcical situation where, in the middle of an election race, the president is going to publicly apologize for crimes his main rival committed. In the time since this article was written the headquarters of SINTRAEMCALI have been fire-bombed by persons unknown, and Dr. Molano has been the subject of numerous threats. SINTRAEMCALI released a call for Urgent Action, which has been translated and posted on the Peace Presence website.